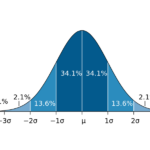 When represented on a graph, data with a normal distribution will appear “bell” shaped. The median score–the 50th percentile–is represented by the center line. For each SD away from the center, we account for a larger share of test takers. 68 percent of all test takers will score within -1σ and 1σ. 95 percent will score within -2σ and 2σ. Lastly, 99.7 percent will score within -3σ and 3σ; scoring more than 4 SD’s above or below the median is extremely rare. 34 percent of MAT test takers will score from 400-425. 13.6 percent will score from 426-450. 2 percent will score from 451-475. 0.1 percent will score from 476-500. Those of you familiar with the exam might know that it is scored on a scale from 200-600. Yet, only 0.1 percent (the 99.9th percentile) can score a 500. To date, the highest score I have personally seen on an official MAT research report is 563, and this was listed as the max score they had recorded. This means the chances of achieving a perfect score on the MAT are astronomically low. Not that any student should be aiming for that; you should instead aim for a good score on the MAT. A good MAT score is definitely achievable for most students and we have plenty of advice to help you get there on the Magoosh MAT Blog. I hope you enjoyed seeing how the exam breaks down.